Rockman 2 The Power Fighters always felt like it had a lot going on. 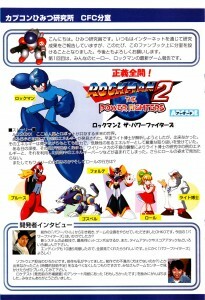 Building up to Rockman’s 10th Anniversary, it was in many ways a marked improvement from the first Rockman arcade title, incorporating separate but intertwined stories and objectives, new challenge mode rankings like time attack, the return of the animal helpers, new upgrades and moves, even a brand new mysterious playable character. With ten different endings in all, it has the most endings of any Rockman game to date, and included some of the most talked about endings in all of classic Rockman. 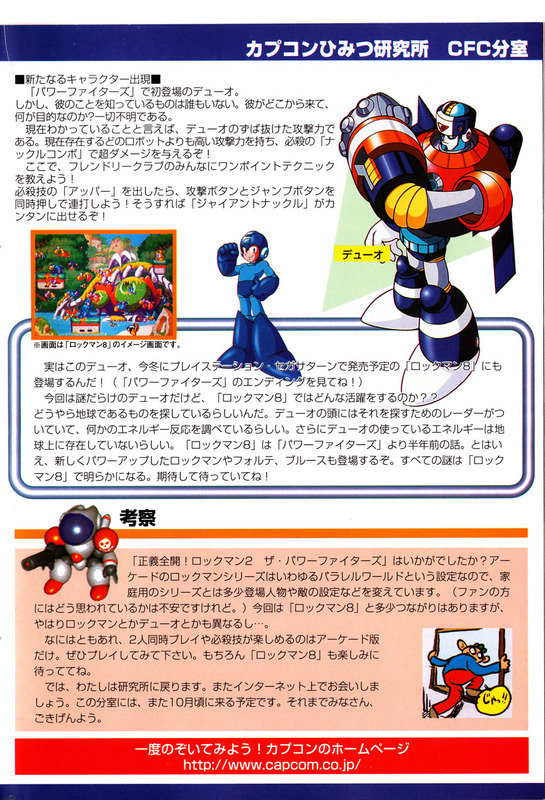 It’s no wonder then that Rockman 2 received a lot of hyping by Capcom, like Rockman’s very first Secret File and this article from CFC Style Fan Book Vol. 1. Hello! Secret Researcher here, reporting in. You know you can always catch up with my findings in my reports via the internet, and now you can find my additional research here in the newly established Fan Book. I hope you’ll enjoy reading these as much as I enjoy writing them! For my first report here, I’ll be doing some digging into the latest game of that beloved hero of everyone, Rockman! A.D. 20XX. The world of the future, where robots and mankind coexist. One day, a yet unknown form of energy was discovered on a small island. Dr. Right wasted no time in setting out to analyze this new energy, but found performing a full analysis impossible. It was soon recognized that despite its infinitesimal size, this energy was incredibly powerful. Great precautions had to be undertaken in handling this incredibly dangerous energy. Then late one night, a code red emergency suddenly rocked the island! Wily mechas had launched a surprise attack, stealing the energy right out from Dr. Right’s experiments as well as the energy parts based on that research that were still under development. Furthermore, Roll was completely missing! Can Wily be up to his old tricks once again? And where on Earth is Roll? Power Fighters marks the introduction of Duo. But as yet, nobody knows much of anything about him! Where does he come from, and what is it he’s really after? For now, those questions remain a mystery. What we do know at present is that Duo has a fighting power that towers above the others. His offensive ability is currently the highest out of all the robots, and his special technique the “Knuckle Combo” deals massage damage! For all you members of the Friendly Club, we’ll now reveal the secret to performing this one point technique, so listen up! Right after using the special move “Upper”, press the attack button and the jump button simultaneously to continue the barrage! Do this correctly and you’ll experience the awesome power of the “Giant Knuckle” attack for yourself! There are still a lot of mysteries surrounding Duo at this time, so what can we expect to see him doing in Rockman 8?? Duo seems to be here on Earth in search of something. He appears to have some sort of radar equipped in his head for detecting energy signatures to help him locate whatever this something is. Furthermore, the energy that Duo himself uses seems to be of a kind that can’t normally be found anywhere on Earth. The story of Rockman 8 takes place half a year before Power Fighters. Even so, you can expect Rockman, Forte, and Blues to return, powered up like never before! All these mysteries should be resolved in Rockman 8. No doubt you’ll be looking forward to it with great anticipation! *Pictured here is an image screen for Rockman 8. In any case, we hope you enjoy the new special moves and simultaneous two player action that you’ll only find in the arcade version. You certainly don’t want to miss out on playing this! And of course, keep that anticipation running for Rockman 8 as well! Well then, it’s about time I was returning to the lab. Let’s meet again soon, remember you can always find me on the internet. And I’ll be back at this annex again for the next issue we’re planning for around October. 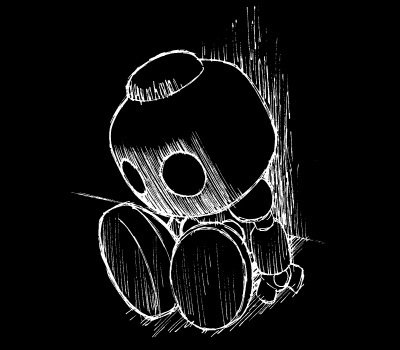 Until then my friends, I must bid you adieu! 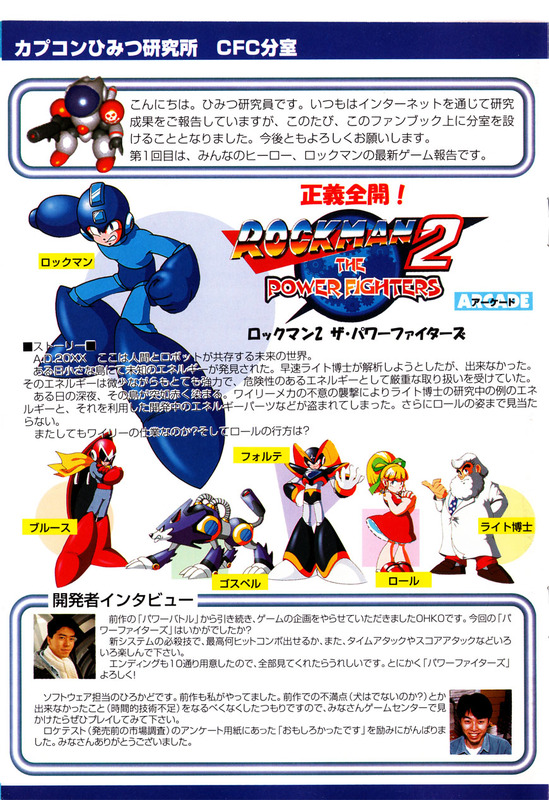 This article from the very first issue of the CFC Style Fan-Book was to serve as the prototype for a series called the Capcom Secret Laboratory (“Capcom Himitsu Kenkyuujo”). Its initial focus split between hyping a new game using game tips and developer commentary with acting as a segue/addendum to the Capcom web page’s newly revamped Secret Lab section. After the initial article, the column switched gears and went fully into being an entertaining companion to the web site, told in an illustrated style. The site itself was a lot like the books, with both fan art submissions and rare pieces by Capcom artists, merchandise news, question and answers, and various photos, stories and other examples of the Capcom staff hard at work at having fun and being silly. Since they never returned to the initial format seen here, this article is fairly unique. I’m sure that just as they predicted there, some fans are bound to be raising their eyebrows at the talk of parallel worlds when it comes to side games or spin-off series, even when the games in question share a link. Fans just experienced something like that again just recently with Zero’s trouble getting home after his adventures in Marvel vs Capcom 3 (becoming especially redundant since cross-over titles are always standardly non-canon/omniverse “for funsies” stories anyways). Just like with their comic book partners, Capcom knows that the parallel world concept comes in handy when you’ve got extra stories to sell tell, and only a loose sense of continuity to work with. (For example, Mega Mission!) In addition to keeping with a time honored tradition of minimizing contradictions and keeping storytellers from writing themselves into a corner, it allows the fans themselves to interpret their own personal canons for maximum enjoyment (or sometimes, frustration)! In this case, it might account for some of the minor differences noted before. I personally hope that someday we’ll see 2 player simultaneous platformer action on a new home console and via the internet (maybe even in the retooled Mega Man Universe, but I won’t get my hopes up), yet in the meantime the release of Power Battle and Power Fighters (in the Mega Man Collection and Rockman Power Battle Fighters) on home systems in the last decade is still a pretty cool consolation prize. While writing this article I’ve been developing a strong craving to play the old titles over again. I think it’s time for my enemies to once again feel the awesome power of the Giant Knuckle! 8 Comments to "Ultimate Justice on Parallel Earths"
There are a few things in this article that immediately jump out at me. First, this: “…my findings in my reports via the internet”. This article was written in, what, 1996, and they’re already active on the Internet? This is pretty impressive considering how early the World Wide Web was at that stage. Considering how long we’ve talked about how Dr. Wily introduces Zero’s design to Bass, and Proto Man’s now famous core instability, should that comment lead us to ignore these plot points if you’re considering the straight canon, or are they safe through other sources or references? Finally, that description reads like Dr. Wily found some extra Evil Energy six months after the events of Mega Man 8. I doubt that it’s really the case considering that this game’s events can be ignored, but it’s worth noting. I don’t want to worry you guys too much about parallel worlds. It’s roughly the same as just being a step removed. Like with classic Rockman, you’ve got your core titles 1-10, then you’ve got your Game Boy version the World series that are both kind of separate and kind of connected. Following that, you’ve got your Arcade version with the Power series, plus other games that get further and further away from the mainstream like Rockboard, Soccer, Super Adventure, and so on. Expressing that distance in setting is akin to saying it takes place parallel to or slightly outside the original numbered games set. Like a few years ago when Rockman 9 was coming out, Inafune said in an interview that Rockman & Forte existed parallel to Rockman 9. That didn’t stop 9 from referencing Rockman & Forte in its ending. Being parallel isn’t that far removed, and as far as I’m concerned it’s definitely not anywhere close to being as outside as a completely alternate timeline like Battle Network’s. Yet that’s really my interpretation as much as anything. When Mega Man Network put up an editorial on readdressing the meaning of canon, I thought they were making the point that every franchise iteration has its own canon, and all canons should be considered. Which I thought was a pretty enlightened viewpoint and wrote a blog post supporting, before someone explained to me that they were actually wanting to make just one canon that is synonymous with anything and everything that Capcom has ever signed off on officially (so I said “nuts to that!” and deleted it). But that’s still how I feel pretty much. You know Power Fighters is connected in timeline to Rockman 8, the above pretty much says so. But is Rockman 8 connected to Power Fighters? Yes and no: fans could take it or leave it, really. Such is the bizarre nature of “side stories,” they fit and they don’t. Blues having a power instability and Wily building Zero have plenty of basis outside of this game, so I guess if you didn’t see Power Fighters as canon you’d just rely on what can be learned in other sources (that you would consider canon). Like if you came across a different Capcom source that said Wily once showed Forte his plans for Zero (I don’t know that there is one, just making up an example here) you’d say “okay something like that happened, but that doesn’t mean it went down exactly how it did in Power Fighters!” Since Capcom’s generally content to leave it all loose while at the same time adding in plenty of throwbacks and easter eggs, I don’t know what the chances are of either view ever really being proven right or wrong, so I don’t really care to argue about any of that. Everyone’s entitled to their opinions, pretty much. Back to this story, it’s basically an abridged version of the one they packed into the soundtrack, that explained (kind of) that it was an alien energy that could be made into good or evil. It might have been an impure form of Evil Energy that lost its negative charge, or it could have gotten left behind from Duo when he was traveling the world, so he returns to collect it. The details of that are still open and mysterious, too. That was an attempt by Tim to try to clear up the muddled and inaccurate use of “canon” in relation to Mega Man. Simply put, there are many canons across the many versions of Mega Man made or licensed by Capcom: the EXE anime is canon, as is Battle Network, but both are separate continuities. Or the Ruby-Spears animated series and the NES games and the Ariga Megamix manga and the upcoming Archie comic. All canon, all different, separate continuities. If anything, we at The Mega Man Network have really relaxed on trying to fit everything together. Every time a new game comes out or a new timeline is posted by Inti Creates, it just gets more and more bonkers. So rather than trying to fit every round peg into a square hole, our mission has become less to make sense of it all, and more to present all the available info we can, and let fans determine things more for themselves. But really, your interpretation was far more on the mark. Hey LBD! Thanks for setting this straight. That’s certainly the right article, it’s been a while since I’ve seen it. It’s cool to hear that we actually agree after all. Aww, so it was just a mockup? I do think it definitely looks better with what they went with. Looks more jungle-y and more secret base-y. The way I see it, this “parallel” business is just that in the case of contradictions, we are to refer to the mainstream titles as the definite version. However, when it comes to additional sources, I’m sure Capcom will undoubtedly blur the line between mainstream and sidegames, so we can just include Power Fighters in the timeline nonetheless.